Chief Justice asks that courts be considered a "sensitive location." Her statement was echoed recently by some judges and attorneys from around the state who say reports and rumors of enforcement action by Immigration, Customs and Enforcement at or near courthouses can hinder court activities. According to a report published by the Los Angeles Times, Octavio Chaidez, a Los Angeles-based defense attorney, said he and his client were walking out of a courtroom in Pasadena last month when four ICE agents approached his client, asked for his name and detained him. Prior to the release of the Times article, judges, lawyers and court staff statewide were already recognizing an increased fear among litigants about the possibility of being detained on court premises. “There’s a real fear that ICE agents will come to the courts and detain them,” said Veronica Henderson, a self-help attorney at Superior Court of Imperial County. Henderson works closely with self-represented litigants who visit the court for a variety of legal issues, including tenant and landlord disputes, domestic violence, and probate guardianships. With the new administration’s immigration policies, Henderson said families are preparing for the possibility of deportation and are requesting help for probate guardianships. Sasha Morgan, self-help attorney and director of operations at the Superior Court of Santa Cruz County, said the possibility of mass deportation is also a real concern in her community. Judge Dean Stout, a Judicial Council member and presiding judge of the Superior Court of Inyo County, said he has not seen nor heard of any ICE agents in or around his courthouse. However, since the publication of the Los Angeles Times report, he fears that some court users won’t step foot into the courthouse. "It’s not a matter of the right, duty, or obligations of federal agents to enforce our immigration laws. Rather, it is a matter of exercising discretion as to when and where such enforcement activities take place, particularly when dealing with 'sensitive' locations," said Judge Stout. Another superior court judge in Los Angeles shared a story about a rumor of a raid in one court that escalated from “grave concern to near hysteria.” Although the rumor wasn’t accurate, the court received calls from many lawyers wondering if ICE was at the court or on the way because their clients were fleeing the courthouse. "I’m not saying do not enforce immigration or federal law," the Chief Justice said during her State of the Judiciary. "I am saying, consider us on the 'sensitive areas' list like a school, like a hospital, like a church--where enforcement of immigration is the exception, not the norm." I’m not saying do not enforce immigration or federal law. 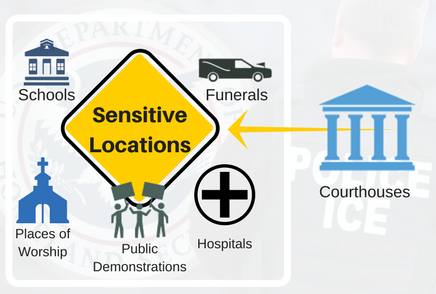 I am saying, consider us on the 'sensitive areas' list like a school, like a hospital, like a church--where enforcement of immigration is the exception, not the norm.